I first knew Jean in high school as my best friend’s big sister. Just like her little sister, she could do anything. Years ago, I marveled at how she cut out some paisley-print fabric and stitched up a tent dress one Saturday, finished and hemmed just in time for her date that night. The other day, I marveled at pictures she took on a recent photography safari to Africa and hundreds she has taken on the Newbern catfish farm that she and her husband, Byron, own. A retired biology teacher, Jean has put the nature she loves into pictures that she prints and frames herself or makes into note cards, a business known as Nana’s Nature Photos. Some have been published in Country Magazine, and some are sold in gift shops and galleries throughout the Black Belt and as far south as Orange Beach. I would say her prints rival those of Abraham Lincoln over at the Brookville, Ohio, Daily Photo Blog. 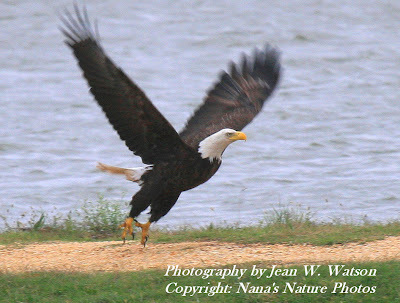 Among my farm favorites is one she took of an eagle, wings widespread, tiptoeing to take flight right there by a fish pond! She has a treasure trove of macros — viceroy butterflies, frogs in a pond, hummingbirds in flight and flowers galore. With her science background, she looks beyond the crispy clear photograph. “I love the mechanics of all these animals,” she told me, and she’s talking not just about the fauna out the front door but about the African species she “shot.” That would include everything from flamingoes to elephants and leopards to giraffes. She’s living a biologist’s dream…on a farm…close to nature…sharing her knack for capturing creation with her grandchildren, her community and folks who appreciate pictures that just can’t be described with words. She sounds like quite an inspiration! Beautiful photography of animals holds a very special place in my heart! Thanks for the blog, Janet. You make life on a catfish farm sound as wonderful as it truly is! Hi Betty, thank you for stopping by! Keep taking those photos. Hale County has some beautiful churches that need preserving not only in structure but in pictures too! I know Jean will appreciate the compliment as well. To wait all day for the perfect photo... we all need that patience. Amazing photo of the Eagle. She's a very talented woman! Hi Sandi, Kristen and Manuela! Thanks for visiting. Hope you have a great week! Beautiful photography! Thanks so much for stopping by my blog!